When you are using a load balancer with two or more backend nodes(web servers) you will probably need some data to be mirrored between the two nodes. A high availability solution is offered by GlusterFS. Within this article, I am going to show how you can set volume replication between two CentOS 7 servers. We should now be able to ping between the nodes. You can use service glusterd status and glusterfsd --version to check all is working properly. Remember, all the installation steps should be executed on both servers! We need to create now the shared volume, and this can be done from any of the two servers. This creates a shared volume named shareddata, with two replicas on node1 and node2 servers, under /shared-folder path. It will also silently create the shared-folder directory if it doesn't exist.If there are more servers in the cluster, do adjust the replica number in the above command. The "force" parameter was needed, because we replicated in the root partition. It is not needed when creating under another partition. This is how you mirror one folder between two servers. Just keep in mind, you will need to use the mount point /mnt/glusterfs in your projects, for the replication to work. One of the tasks a sysadmin will always have on their list is backing up databases. These backups are also called dump files because, usually, they are generated with mysqldump command. I am going to share a few tricks on mysqldump that will help when handling servers with many relatively small databases. The most simple way to backup databases would be using mysqldump command with the the --all-databases attribute. But I find that having each database saved in its own file more convenient to use. where *** is your root password. The aditional parameters --skip-lock-tables --skip-add-locks --quick --single-transaction assure availability and consistency of dump file for InnoDB databases (the default storage engine as of MySQL 5.5.5). Mysql stores databases in folders using same name as database name in /var/lib/mysql. The command picks database names from the listing of /var/lib/mysql folder and exports to files using same name adding the .sql. I find this to be hard to type and prefer to use one I will explain in point 2, since it also covers this. This picks database names to export form mysql show databases command. This wil replace / with _ for the dump file names. For all of the above, we could (for obvious reasons) not use root mysql user. We could also run the backing up from a different location. In order to do this, we would need to create a mysql user with the right privileges on the machine we want to back up. where 111.222.333.444 is the ip of the remote machine. where 444.333.222.111 is the ip of the machine we want to backup. Lets take it to the next step , and put all our knowledge in a shell script. This will also compress the dump files to save storage. Save the script as backup-mysql.sh somewhere on the machine you want backups saved, ensure you have the mysql user with the right credentials on the server hosting the mysql. You will also need mysql installed on the backup server. Executesudo chmod 700 backup-mysql.sh. Run the script with sudo sh backup-mysql.sh . After making sure it works properly, you can also add it to your crontab, so that it runs on a regular schedule. Before I started to learn Go, every online opinion I would read about the language complained about the lack of generics and how OOP was dumbed down and so on. It made me put off learning it for quite some time, more than I would like to admit. Coming from a C++ background, OOP, generics and meta-programming was my daily bread. It wasn't until I had to actually learn Go that I saw what it offered me in terms of OOP and it was just enough. As such, I wanted to put a side-by-side comparison of typical C++ code that deals with classes, and it's corresponding implementation in Go that does more or less the same thing. This is by no means an exhaustive list of examples, but I thought it might prove useful for someone trying to figure out Go. To run all Go examples, copy them to a file and run [crayon-5cbb8a61e709e048072148-i/] . To run all C++ examples, copy them to a file and run [crayon-5cbb8a61e70b0591349422-i/] . There are basic equivalences between traditional OOP languages like C++ and the syntax and functionality that Golang provides. In it's own simple way, Golang provides ways to implement encapsulation, inheritance and polymorphism. In my humble opinion, these mechanisms are enough for most object-oriented projects. Many of you probably experienced this. You edit a file in Linux with Vim or Nano or whatever else text editor you might be using and when you try to save, you realise you forgot to launch the editor with sudo privileges, and file can't be written. Exiting without saving and editing again with sudo privileges is not always an option, especially if you lose a lot of work. Now you can go back to your editor and saving will be possible. Don't forget to change back the right permissions for your file. Also, you could save in a new file and then copy the newly created file over the old one. But these are workarounds. Vim editor actually offers a solution. So Vim actually makes magic happen. Reading the Redis documentation can be a bit confusing without the hands-on experience. You could in theory create multiple processes of the Redis Server on your machine and configure each of them in part, but what if you could do it in a few commands? Not only that but emulate the network they’re connected to as well. So, starting from that example, I’ve tried to do the next best thing, which is to create a single docker-compose.yml file for all of it. Removing the need to build each image, just to do a docker-compose up and scale as needed. You can now observe the communication between the sentinels and slaves. After the down-after-milliseconds and failover timeout passes, one of the slaves will be selected for promotion. After the sentinels agree on the selection, the slave will become the new master. The old master will now become a slave of the new master and perform a sync. That’s about it. As an exercise you could try setting up a cluster starting from this and observe failovers there. There are several ways to extend a business model but API is a hot topic right now as the online world is expanding very fast. If you’re a developer or at least interacted with APIs before, you probably know why public APIs are so important, but there’s a big chance you didn’t hear or care about them before and now you’re wondering why everyone talks about them. There is a simple way of saying this: an API is like a contract between two computer software agreeing to share information in a more or less standardised way. Now it’s pretty clear what are we talking about, but why are them so important? How can APIs help us? In the following rows I will try to argument some good reasons. You can grow your online business by integrating with additional tools or apps and engaging with others. This can be done using public APIs. Let’s take Uber and Google Maps: everytime you search directions in Google Maps (from home to work, i.e.) you can automatically request an Uber, see your driver on the map or even contact him, all without having to leave Maps app thanks to Uber’s API. Or if you have an online store, you might wanna offer public APIs so other apps can request price offers and display your products on their platforms. It’s all sweet and fun to start a new business and you probably want to do it faster and cost effective. Usually this means a monolithic application. Success means scaling and this can be done by breaking the app into microservices. This will enable multiple options for you. Let’s say you have a microservice that is being used very often and affects your server. That microservice can be moved on a new server with dedicated resources only for it and it will be accessible for the rest of the app via an API. Or there is the case when you want to rewrite a single microservice (some languages are more efficient than others). This is the beauty of standardised API - you only have to make sure you accept the same API call as before and return the answer in the same format, so other dependent services won’t be affected. UX/UI is very important and we strongly advise you to continue to invest in that area, but there are cases when having to explore an UI for some actions is time consuming for some (more technical) users. Let’s take SendGrid and their Marketing Campaigns app. You can create a new campaign by going through the UI process or you can simply make a call to their API. Second option is usually faster (but for more technical people or at least you need to develop an integration first) and the flow will always be the same, while UI can suffer some modifications over the time. At some point you will probably want to add a dedicated mobile app to your business. Having APIs makes it possible. You are free to develop a new design or a new template without any changes on the API side. Providing APIs must be a concern for every company, whether they focus on internal operations, partner integrations or public access. Join the revolution! Add API support to your product! Get a free quote now. For those who need to count words and lines in text files, an easy approach for this matter is to use bufio.ScanWords and bufio.ScanLine in order to quickly solve the problem. ScanWords is a split function for a Scanner that returns each space-separated (checks unicode.IsSpace) word of text, with trimmed whitespace. ScanLines is a split function for a Scanner that returns each line of text (separated by "\r?\n"). It returns also empty lines and the last line is returned even if it has no newline at the end. We’ve recently had some problems with a Go application that was running inside a Docker container in a very big Docker Compose setup. After getting fed up with writing console prints and rebuilding the Docker image for that container and spinning up all the containers to debug things, we started investigating how we could speed up our debugging process. Enter Visual Studio Code and its wonderful Go extension which supports Delve. Now if you read through the pages linked above you will find out how to install and setup all these things. It’s pretty straight forward. The Docker part, however, is not. As such, I will show you a basic Go application which mimics what we had to deal with and how to set up debugging for it. The following is the main.go of our app. It will connect to a Redis server, set and get a value. As you can see, it relies on the Redigo package, so make sure you get it and place it in your vendor folder. If you run the application built this way, it will fail of course, because you need to connect to Redis. I’ve set the hostname for the server to redis which will point to an IP on the docker-machine when we docker-compose up. Now we have to build the image for this application. When this image will be built, it will basically copy the application code, set up the environment and build the Go application. The application’s entrypoint will be the main executable that will be built. We also install the Delve command line tool but we won’t use it if we run a container from this image directly (i.e. docker run). Note the GOPATH variable and the path to which we copy our code. This path is very important for Delve and our debug configuration. Now that we have the Dockerfile to build the image, we have to define the docker-compose.yml file. Here, however we will overwrite the entrypoint for the container to launch Delve. Also the code that we copied will be replaced with a volume that will point to the code on the host machine, and we will also remove some security constraints that prevent Delve from forking the process. Essentially, for the context I mentioned above we try not to touch the base image for the application since it might get accidentally pushed to the Docker Hub with debugging parameters. So in order to avoid that we have our Docker Compose process override the image with what we need to go about debugging. It's here that we introduce the Redis server dependency we have. Note that for the myapp container we’ve exposed the ports that the Delve command line tool listens to. This will build the image and start up the redis and myapp containers. Which means that the Delve command line tool compiled our Go code into a debug executable, started it, and it’s listening for remote connections to the debugger on port 2345. Now we just have to set up our launch.json config in the .vscode folder of our project. You might have to change the host IP to what your docker-machine ip output is. Now all we have to do is set up a few breakpoints and start the debugger using the Remote Docker configuration. You can Next and Continue, look at the callstack, see the locals, view contents of specific variables, etc. I hope this proves to be as useful to you as it did for us. The tools mentioned in this post really save us a heap of trouble. We really have to thank the open source community that brought us these tools. They are the real heroes. Being a QA engineer is a continuous struggle in finding the right resources in order to get the job done easier and more efficiently. If you are planning to write automated tests in RSpec (Ruby's testing framework), then you should take a look over these gems. Please notice that I am most of the time automating backend tests only, so the libraries I am using are for this purpose mainly. If you want to make API calls on RESTful endpoints this should definitely be your choice. This library is easy to use and the response includes code, cookies, headers and body. Now you simply use this response for your purposes (response.code, response.body, etc.). If I told you about RestClient, then the next one should be json. RESTful services will return JSON format in body most of the times so you should parse that response to be easier to work with. See how simple this is? You only JSON.parse that response and that's all! JSON and XML are the most used formats in web development. So you probably guessed that now I will show you some tricks on how to use XML in your awesome tests. Also, you can use xpath instead of css. This gem is used to mock endpoints. See more about it here. It is recommended to keep environment variables and stuff like usernames, passwords and URLs in a .env file. In order to load those variables in your tests, you must use this gem. First you load the .env file, then use those variables in your tests. I will update this post when I will use some new awesome Ruby library. What gems are you using? Building and using C++ libraries can be a daunting task, even more so for big libraries like OpenCV. This article should get you started with a minimal build of OpenCV and a sample application written in C++. This application will get images from the webcam, draw rectangles around the faces in the images and show them to you on screen. I've built this on a MacBook Pro running OS X El Capitan Version 10.11.1. We'll be using the GNU C++ compiler (g++) from the command line. Note that you should still have Xcode installed (I have Xcode 7.1 installed). Get "OpenCV for Linux/Mac" from the OpenCV Downloads Page I got version 3.0. Extract the contents of the zip file from step 1 to a folder of your choosing (I chose ~/opencv-3.0.0). Get a binary distribution of Cmake from the Cmake Downloads Page I got cmake-3.4.0-Darwin-x86_64.dmg. OpenCV uses CMake files to describe how the project needs to be built. CMake can transform these files into actual project settings (e.g. an Xcode project, Unix makefiles, a Visual Studio project, etc.) depending on the generator you choose. First open CMake and a small window will pop-up that will let you choose your build options based on the CMakeList.txt files in the opencv source directory. First click on the Browse Source... button and choose the path to the opencv source folder (the folder you extracted the zip file to at step 2). Then click on the Browse Build... button and choose a path to a build folder, I'm going to create a new folder called build in the previously mentioned source folder. 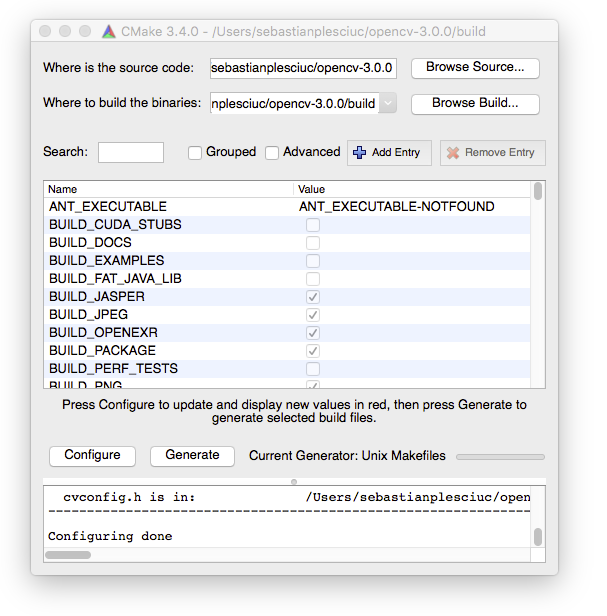 You should disable the options that are not in the list, especially the BUILD_SHARED_LIBS one. Don't touch the options that are text fields unless you know what you're doing. Most of these options you don't need for this particular exercise, but it will save you time by not having to rebuild OpenCV should you decide to try something else. Once you have selected the settings above, click Generate. Now you can navigate to the build folder, I'll do so with cd ~/opencv-3.0.0/build/ and run make to build OpenCV. If everything goes well, after the build finishes, run make install to add the OpenCV includes to the /usr/local/include folder and the libraries to the /usr/local/lib and /usr/local/share/OpenCV/3rdparty/lib folders. After that's done, you should be able to build your own C++ applications that link against OpenCV. Hopefully, no errors should occur. Before running the application, you have to copy the lbpcascade_frontalface.xml next to the main file. You can find this file in the OpenCV source folder under /data/lbpcascades/. You can also find some other cascades to detect eyes, cat faces, etc. Now just run the ./main and enjoy!